SustainableWork: A wonderful Urban Economic Development summit! I had the privilege of making a presentation this week at the Urban Economic Development Association of Wisconsin Summit in Milwaukee. I got to catch up with old friends and meet many wonderful new friends. I love the Milwaukee area. Among many other virtues, this amazing region is globally vibrant in the world of food. 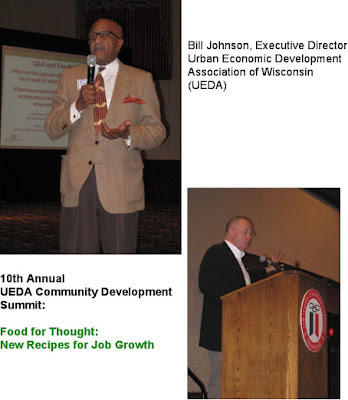 This years topic is: "Food for Thought: New Recipes for Job Growth" Participants from throughout Southeast Wisconsin will gather to discuss how the regional food economy can become a driver for job creation." My proposition was that the experiments we are running at the Wisconsin Innovation Kitchen should be replicated in the Milwaukee area. In fact, a great group of new friends I met at the UEDA summit are already taking action steps in that direction. Action steps, for me, are the definition of a great conference. Thank you for the invitation UEDA! Thanks to Executive Director Bill Johnson and Kristi Luzar who made all the conference magic happen!. Radio Interview at the Summit. Rick and Shelly Jurewicz from M7. Wisconsin Public Radio. Previous post about the 2011 UEDA Summit with full list of speakers. Also, my first post about the UEDA Summit.